Humour in simple terms is to put someone in good mood. When students in a classroom are in a good mood, they are more receptive to what is said. A little bit of laughter in the classroom opens up the mind and goes a long way in triggering the interest and motivation to learn. 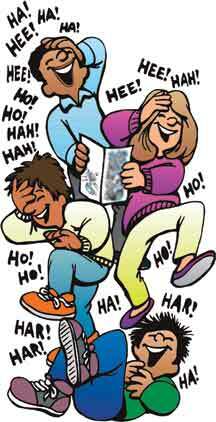 Humour acts as an ice-breaker and helps the teacher develop a good rapport with the students. However, it has to be kept in mind that humour should be relevant otherwise it can distract from learning the subject being taught. Exaggerate – One way to exaggerate when teaching is with numbers. For example, students can learn to distinguish 15 from 50 if you emphasize the different rhythm of 15 by writing it as fifteeeeeeeeeeeen on the blackboard. Students laugh at this, but they also remember to give a little extra emphasis to the teens as opposed to the tens. You can also exaggerate with your voice. Emphasize words like “BIG” or “LOUD”, and lower your voice for “small”, “quiet”, or “soft”. Students will often copy you when you do this. Make intentional mistakes – Mistakes can be turned into humour and at the same time test students’ listening ability. You can easily convert any statement into a mistake by changing one key word and see how students respond. You can also make mistakes when writing on the blackboard. You can add two or three mistakes during any class period. Make sure to give a few brownie points to students who catch the mistakes!